GREENSBORO, NC--(Marketwire - Sep 11, 2012) - Life is all about making connections. For those seeking a relaxing North Carolina getaway, connecting with an upscale and modern hotel in Greensboro is the first step to taking the hassle out of planning a vacation. Online access to hotel deals, discounts and packages make booking a breeze at the sophisticated Greensboro-High Point Marriott Airport Hotel, but simplicity doesn't stop there. Factor into the equation a host of online apps available through the hotel's website, including "things to do," events, nightlife, shopping, business essentials and even practical information, and travelers are well on their way to plotting out everything needed to plan their travel time -- their way. Noted as the city "Where the Mountains Meet the Coast," there's everything imaginable to do and see in Greensboro. And getting there is easy, as this remarkable hotel near downtown Greensboro is conveniently located on 17 acres of the picturesque Piedmont Triad International Airport, so access is a breeze and airport shuttle is provided "simply" on request. Travelers can start by booking the "Stay for Breakfast" in Greensboro package so they can wake up to a complimentary and delicious breakfast for two adults and two children under 12 years of age, and then take in any of a host of things to do in Greensboro and the surrounding area. For those who are still undecided or just not quite sure which way to turn, the hotel's new interactive lobby media board can easily identify local attractions and events while also keeping guests up-to-date on both local and world news. Whether taking in the Greensboro Children's Museum, Natural Science Center, planning a day of shopping or attending an evening production at the popular Barn Dinner Theatre, guests can rest comfortably and play hard while staying at this exciting choice among hotels near Greensboro Coliseum. From the historic district of Old Greensborough and a host of museums and cultural centers, to parks and outdoor adventures, guests are sure to fill their itinerary with something for everyone. After a day of adventure, there's plenty of room for some relaxation at the hotel, where connecting indoor/outdoor pools, sand volleyball and a fitness center are readily available for stress-free family fun. High-speed Internet access and Plug-In technology makes staying connected with family or business associates easy and guests can also take advantage of premium movie channels and pay-per-view movie options. The Greensboro-High Point Marriott Airport Hotel welcomes travelers with reinvented spaces inside its newly renovated lobby that features communal tables with power and free Wi-Fi Internet access in both the lobby and lounge to provide guests with the services they need to stay connected while traveling. The hotel also is home to the Brush Creek Lounge & Grille, where casual dining in a relaxed atmosphere is available for breakfast, lunch and dinner. Offering contemporary designs and a warm and welcoming atmosphere, guests are sure to experience the joy of simple comforts and attentive service for an outstanding hotel experience. 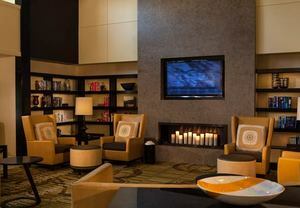 Online access to hotel deals, discounts and packages make booking a breeze at the sophisticated Greensboro-High Point Marriott Airport hotel; but simplicity doesn't stop there. Factor into the equation a host of online apps available through the hotel's website.